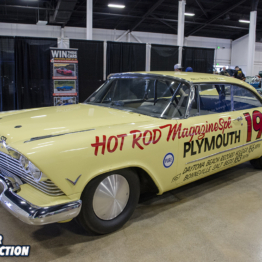 Mickey Thompson (M/T) has long been known as a premier supplier of racing tires, stretching all the way back to Mickey’s record-breaking 406 mph run across the Bonneville Salt Flats in the early 1960’s. 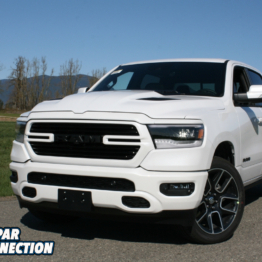 We were born on the track and have never left is one of the legendary brand’s core values and they have stayed true to it by offering an impressive array of truck, street, drag, and off-road tires for almost any application. The latest additions to the ET Street lineup, which debuted in 2004, show M/T’s dedication to maximizing performance for a variety of needs. While other suppliers make one-size-fits-all street/drag tires, M/T has finely sliced the ET Street product line to exactly match your application and give you a leg up on the competition. Tread pattern isn’t much use without a good base material, so the R2 compound was specially formulated with traction in mind. Used on some of the fastest drag cars in the world, the R2 compound is time-tested and proven to provide plenty of stickiness with very little burnout. Jason Moulton, M/T’s Product Development Manager, stated in a previous interview, “The compound used on the ET Street S/S is a close derivative of the R1 compound used on our Pro Drag Radials, and the construction is very similar to our old ET Street Radial”; 15”, 16”, 17”, 18”, 19”, and 20” sizes are available, ranging from 235/60R15 to 305/35R20. 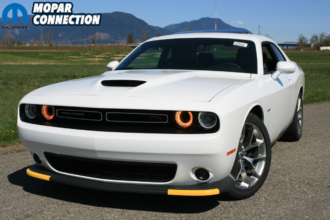 If your Mopar leans towards street savage more than it does dedicated drag, this is the tire for you. Because of the incredible grip characteristics of the R2 compound, AM would, “be a little weary of using this tire, the radial, on a high-horsepower stick car.” If you’re going to do so, make sure the rest of the driveline is up to the task. 15”, 17”, and 18” sizes are available, ranging from 205/50R15 to 305/45R18. 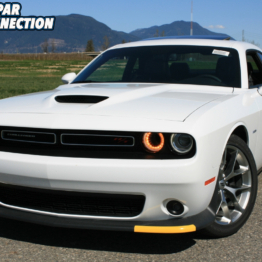 If your Mopar prefers sunny days and a vicious hook, this is the tire for you. Many full-time racers know that bias ply construction can, as AM states, “help absorb the violence of a big-time clutch drop on a sticky track or surface.” They go on to explain, “[M]ost automatic guys can get away with running a drag radial in the rear as the drivetrain shock experience with those guys is far less than what a stick car experiences, even coming off a [transmission] brake.” Essentially, the Street R Bias fills that void for the 3-pedal guys that need both traction and fair weather streetability. Unlike the radial ET Streets, the Street R Bias is made of an M5 compound that is harder than the R2 compound seen in radial versions. 15”, 16”, and 17” sizes are available, ranging from 26X10.50-15LT to 28X11.50-17LT. Also keep in mind that if you’re going to run bias in the rear, the general rule of thumb is to also run bias in the front. 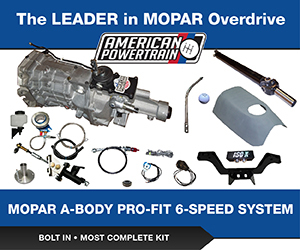 This will provide better front-to-rear driving performance and stability compared to a radial in the front and bias out back. 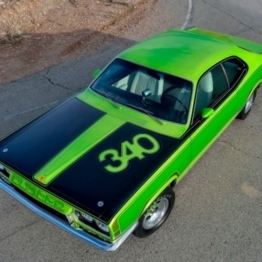 If your Mopar is a stick-shift strip shaker, this is definitely the tire for you. The ET Street Radial Pro is the all-business tire of the bunch. Even though it is DOT approved, M/T does not recommend it for street use. Just like the other ET Street radial options, the Pro is made of M/T’s trusty R2 compound. However, it has much less tread void and a more drag-oriented sidewall. 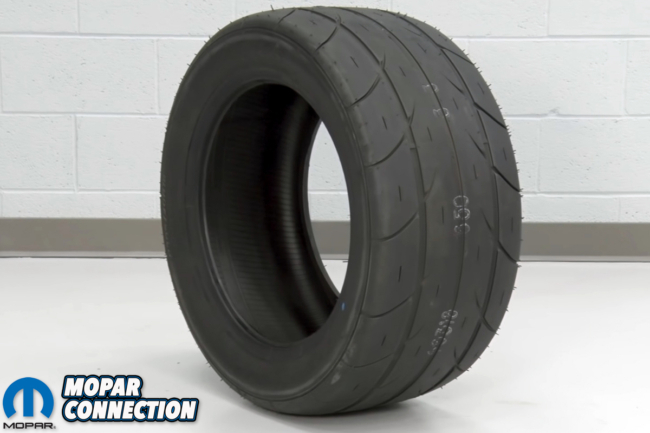 AM goes on to explain that the sidewall is, “almost a hybrid between a traditional radial and a slick in that this tire will wrinkle or flex a little bit more and also allow for a little bit more wheel speed off the line.” Two sizes are available: 275/60R15 and 315/60R15. 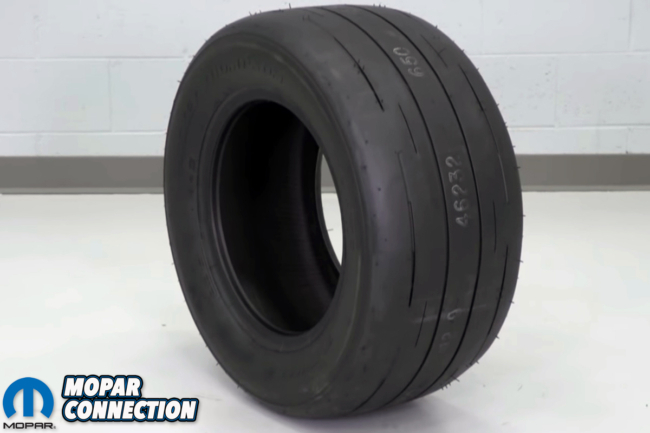 If your Mopar is drag-duty only and runs in a class that requires a 275 or 315 radial, this is the tire for you. As with any tire, air pressure is vitally important. Thankfully, M/T doesn’t just sell tires; they can also help with tire setup to make sure you get the proper longevity and performance. 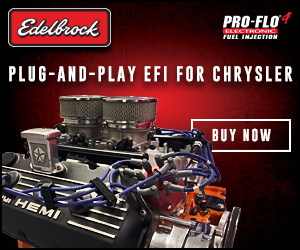 One of their technical bulletins explains, “Proper air pressure is critical to the best performance of your ET Drag or ET Street racing tires. Mickey Thompson strongly suggests investing in a good tire pressure gauge and that you keep accurate and complete records of each pass. 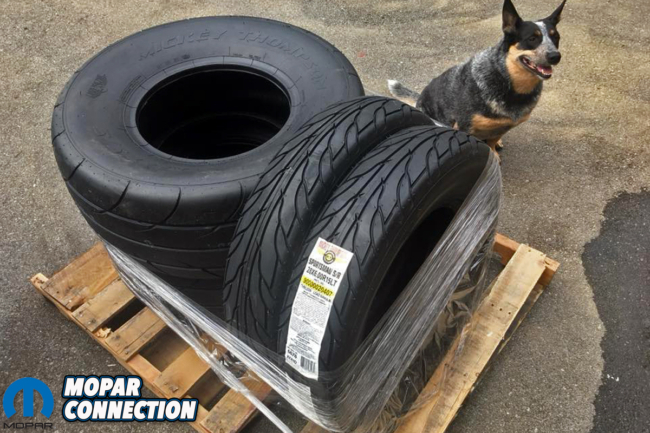 This will aid you in becoming a consistent performer.” Recommending exact air pressure is difficult due to the multitude of applications in which these tires may be used. However, a baseline chart is available to provide starting points. 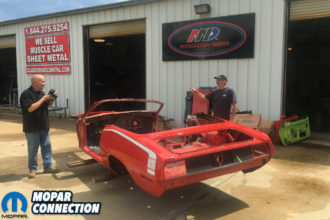 Above left: Earlier this summer, Mopar Connection welcomed the presence of some much-desired Mickey Thompson rubber. 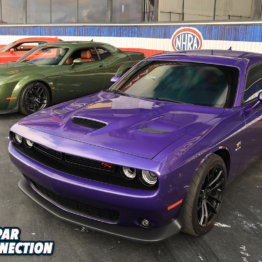 We went with the ET Street SS and Sportsman S/R front runners. Above right: At P295/65R15, we filled our factory wheel well as much as possible. We also employed a 5/16″ spacer to keep our inner liner from contacting. Up front, the narrow 28x6R15 offer a wider footprint but narrower sidewall than our previous vintage-style Pro-Tracs. 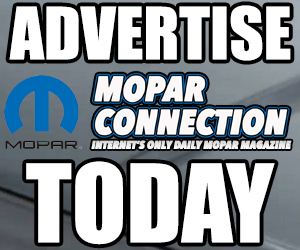 Visit Mickey Thompson Tires or call (330) 928-9092 for questions regarding product selection, setup, or fitment. Also available is a Frequently Asked Questions page with no less than thirty answers to common queries related to drag tires. Topics include recommended rim size, tire growth, burnouts, rotation, and more. 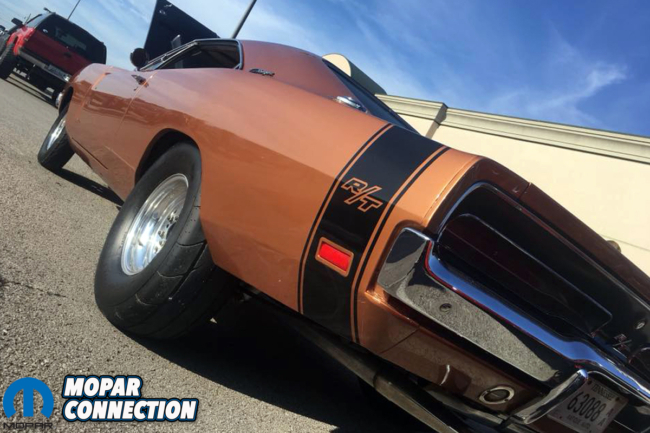 When it does come time to get a grip in your Mopar, you can contact AmericanMuscle for your Mickey Thompson tire needs. Aside from being an M/T distributor, they can also mount and balance wheels and tires that are purchased together. Nitrogen fill is optional and shipping is free. 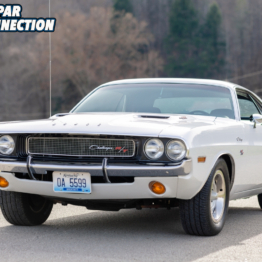 They specialize in 2008-2019 Challenger products, so visit AmericanMuscle or call (877) 887-1105 for more details on pricing and availability.